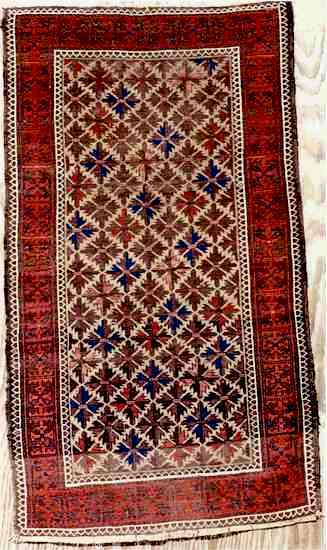 Baluch Rugs are really a type of rug rather than the output of one single ethno-linguistic group. Over a series of pages I will deal with Baluch and the various sub-types. 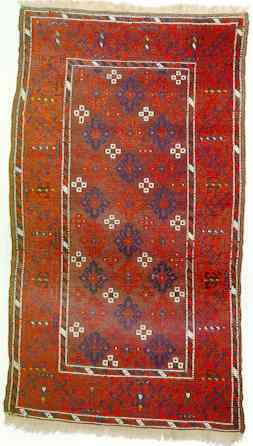 baluch is a language so people whose primary language is Baluch are Baluchi. But the Baluch are also a political entity under Iranian law so the Government also defines who are the Baluch. Then there are the people who are always or even sometimes counted as Baluch. This group includes but not limited to: Barbari, Berberi, Chahar-Aimaq, Char Aimaq, Taimuri (Teimuri, Timuri, Taimouri), Teimurtash, Taimani, Zohri (Zuri), Jamshidi (Jamshedi, Djamchidi, Yemchidi, Dzhemshid), Firozkohi, Maliki, Mizmast, Chinghizi, Zainal, Baluchi, Baluci, Baloci, Makrani, Coastal Balochi, Kechi, Makrani (Lotuni), Rakhshani (Raxshani), Sarawani, Brahuidi, Birahui, Brahuigi, Kur Galli, Jharawan, Kalat, Sarawan. 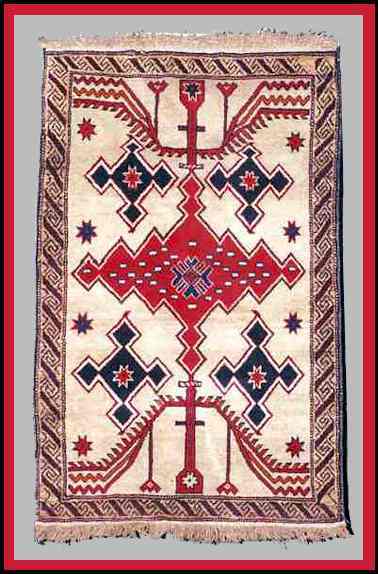 When I first started looking at Oriental Rugs I started with Baluch rugs or more properly Baluch type. 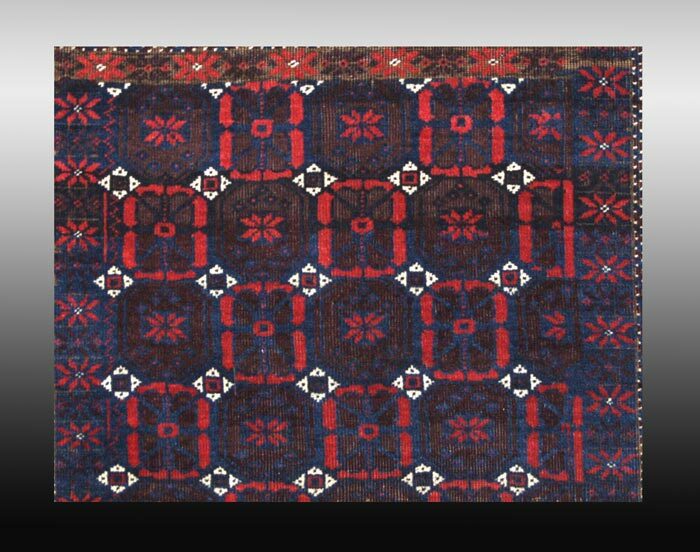 I assumed that Baluch rugs were woven Baluch weavers and that all this must be well documented so that we could look at the structure and pattern of a rug and look them up in a book and know exactly where they were woven and by what groups. But when I went to the books I found it was anything but the case. 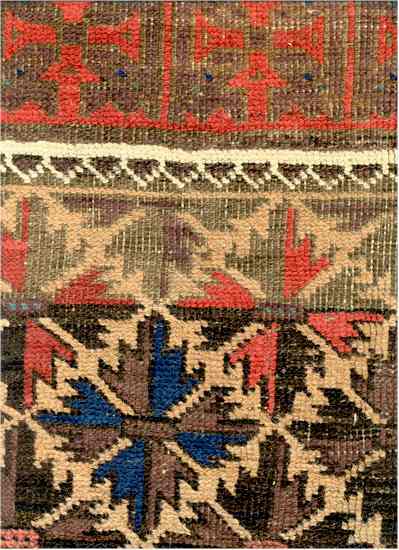 Southern Baluch weave mostly Flatweaves. 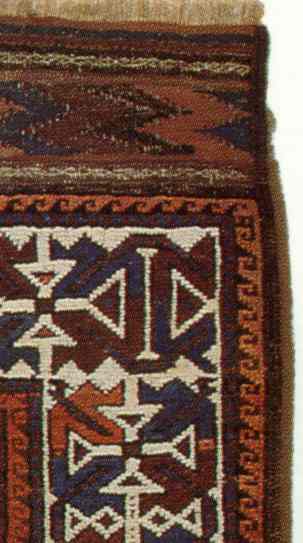 The Southern Baluch weave Kilims that I suspect would test to show a great deal of undyed wool. 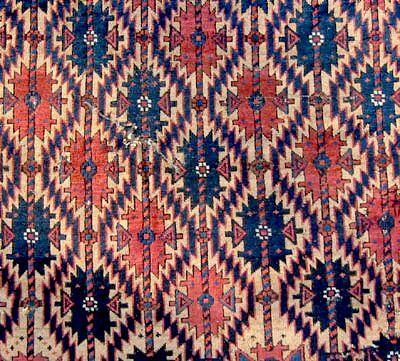 Consequently the Kilims are fairly somber. 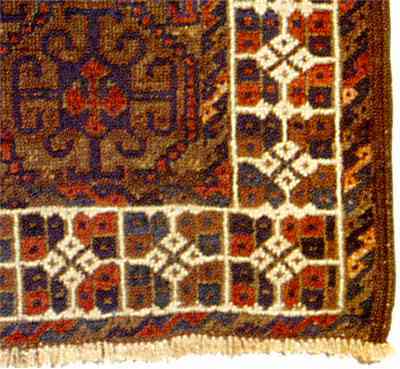 They are also noted for their embroidery. About half of the Western Baluch have settled but many are still migratory herders. 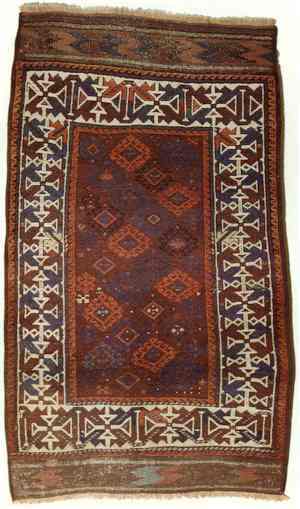 Major producers of rugs, bags, trappings, etc.. There are about 600,000 Western Baluch about two thirds of them are in Iran with most of the rest in Afghanistan and a few in Turkestan. 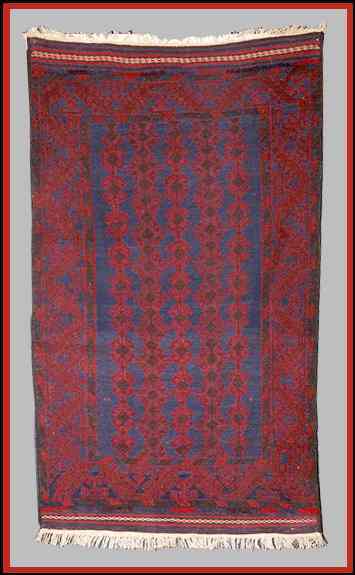 Under the Shah in Iran they were recognized as both a tribe and a political party. Size: 5ft. 10in. by 3ft. 6in. Knots: Symmetric wool, some pale blue cotton. Sides: Original 2 cord hair, selvage repaired. Size: 3 foot 6 inch by 6 foot 6 inch. 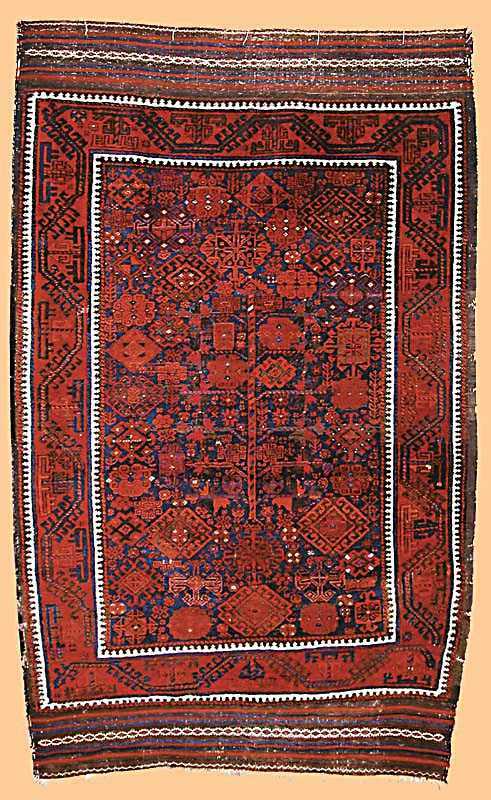 Notes: This is a very pretty traditional pattern Persian Baluch Rug. 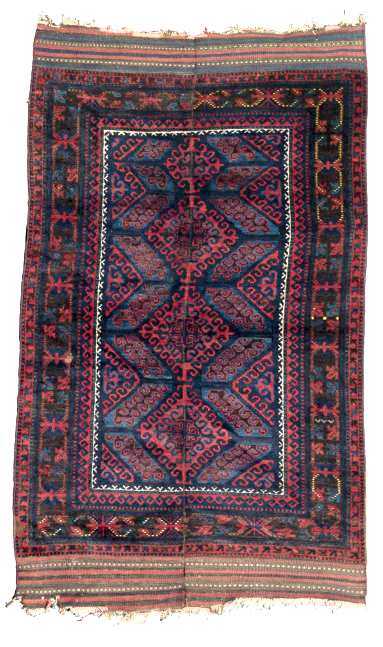 It is a new handmade pile rug from Iran. It is handmade and in new condition. Size: 2 foot 8 inch by 7 foot. Warp: 3 ply corded white cotton. Weft: 2 shots gray cotton. Ends: Post-hitch wharf binding, with 1 inch warp fringe. Selvages: 4 cord reinforced black goat. 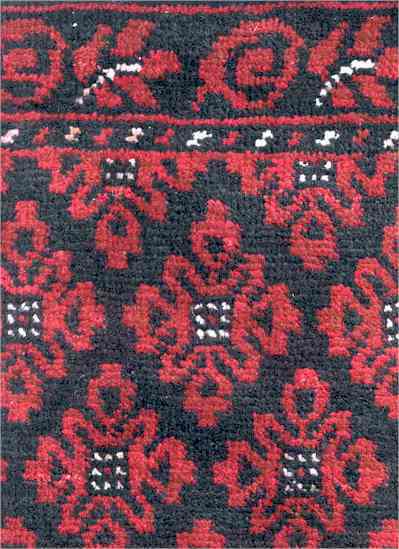 Handle: Soft wool, medium, durable. Further Notes: Very good condition, some wear of selvage and on bottom corners. Size: 2 foot 11 inches by 5 foot 2 inch. (not including fringe). Structure: Symmetrical knot. 8 knots per horizontal inch and 9 knots per vertical inch. 72 per square inch (1116 per square decimeter). Slightly depressed warps. Warp: 2 ply Wool, ivory. 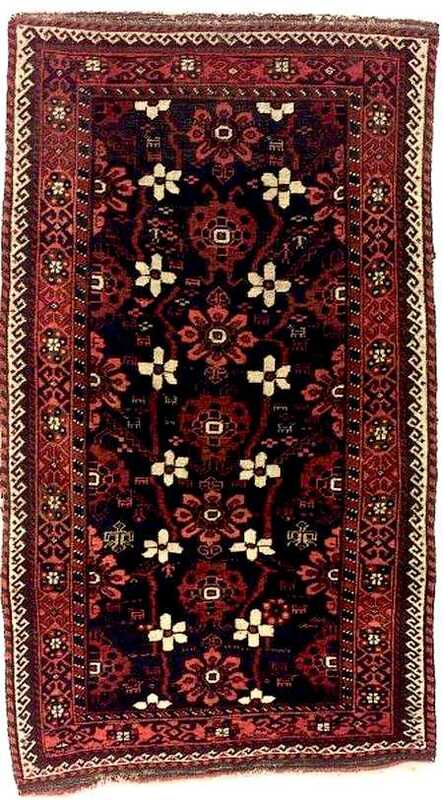 Further Notes: This rug is in very good condition. 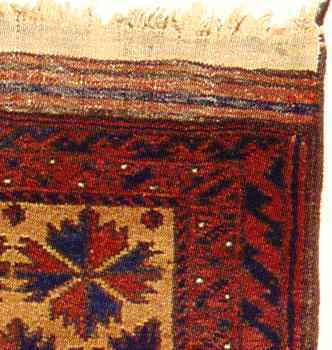 There have been some restoration and the rug is in very good condition. The brown areas show sign of corrosion in keeping with it's age. 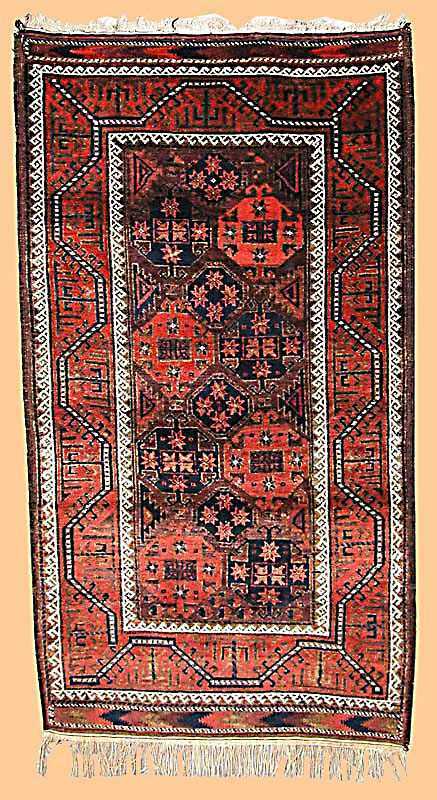 This is an excellent Antique Baluch Rug. 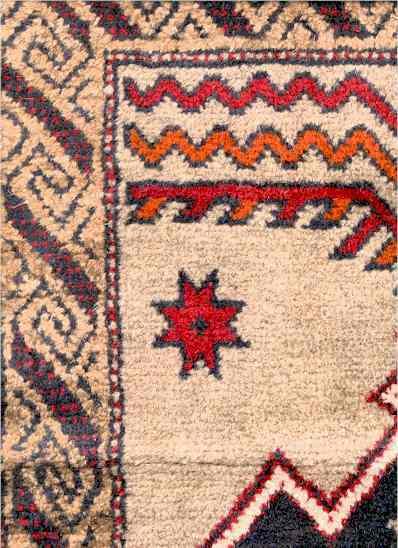 The color is excellent and the camel color may actually be camel wool instead of sheep's wool. 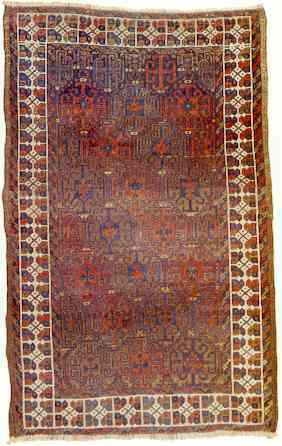 The delicate beauty and sophistication of this piece make me think it is from the Qainat. 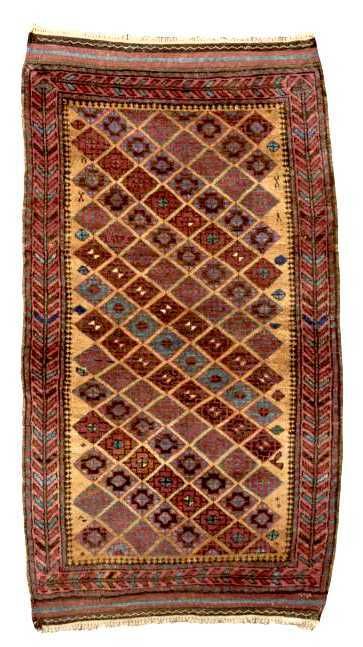 Origin: Northwest Afghanistan, late 20th century. Size: 3 foot 7 inch by 6 foot 3 inch. Weft: 2 ply tan wool. Ends: Overhand knots with 3 inch warp fringe. Selvages: 2 cord interlaced brown wool. This is a large heavy duty durable floorcovering. 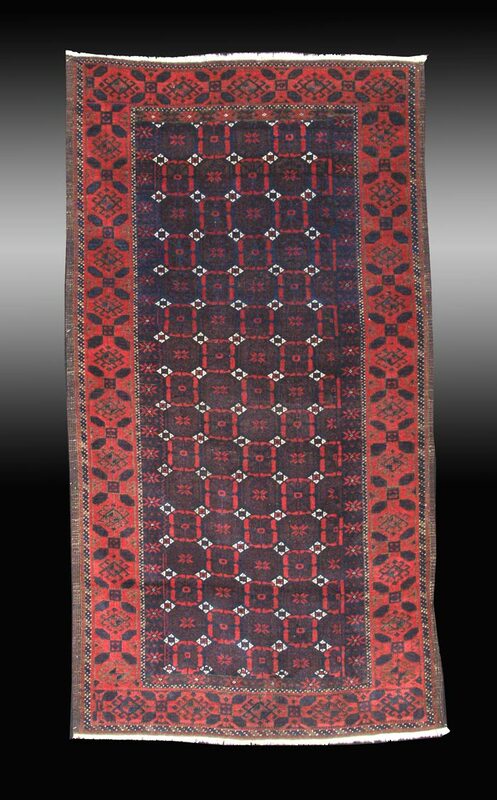 It is a particularly nice Baluch Sumac Kilim. 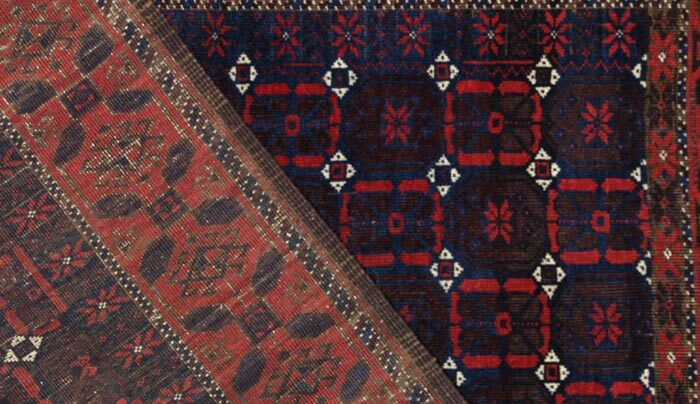 I suspect that these may be Hazara but in the marketplace these are called Baluch. Size: ca. 204 x 111 cm. Size: 5ft. 9in. by 3ft. 2in. 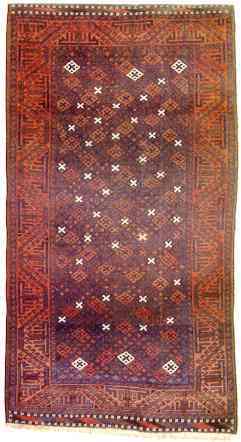 Baluch Rug, Late 19th C.
Size: 4ft. 4in. by 2ft. 8in. 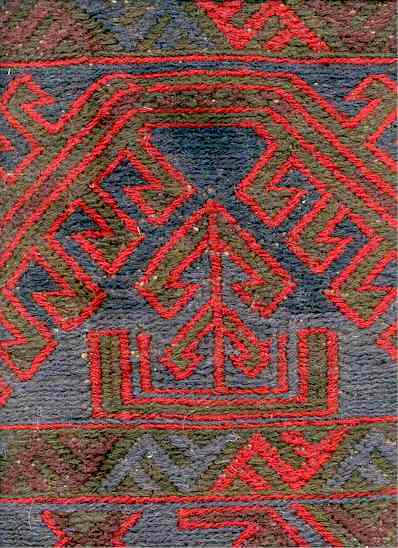 Knots: symmetric, all wool, pulled left. Size: 5ft. 6in. by 2ft. 9in. Size: 5ft. by 2ft. 8in. Size: 3ft. 11in. by 2ft. 3in. 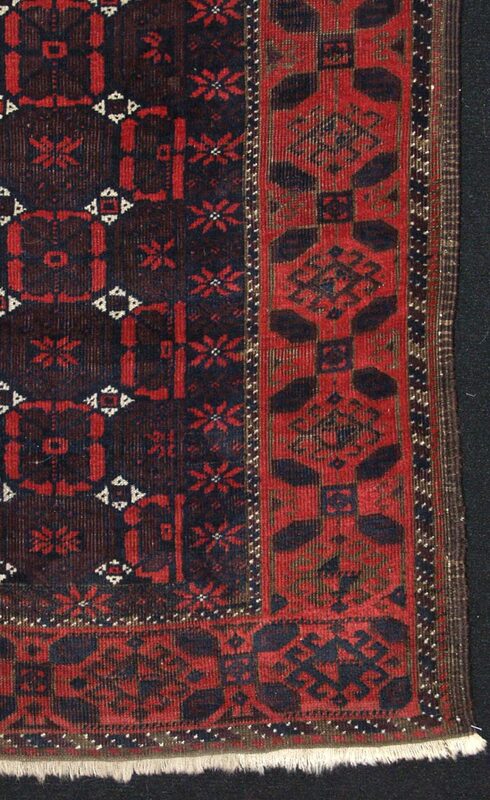 Description: This is an attractive, late 19th century Persian Baluch. Size: 2 foot 8 inch by 4 foot 2 inch. Color: Tan, red, midnight blue, ivory, royal blue, tangerine. Warp: 2 ply brown wool. Weft: 2 shot brown wool. Ends: Heavy crossed wefts 1 inch warp fringe. 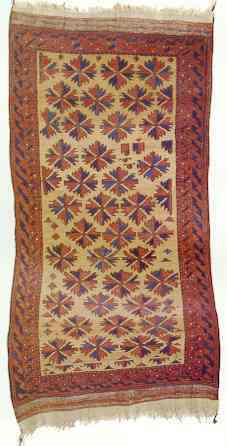 This a very pretty tribal rugs from one of the villages in Northwest Afghanistan. I do not see a lot of this type but I have come across them before. 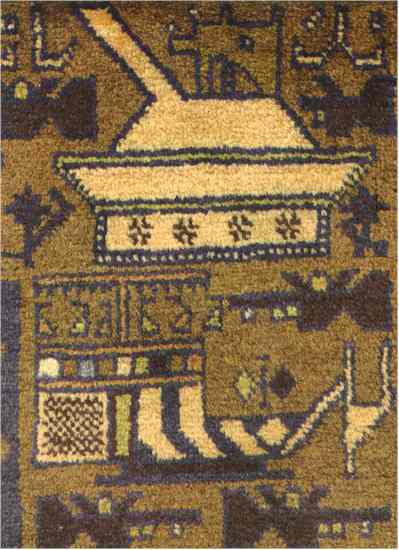 The most intriguing part of this rug is the interplay of the negative space images. 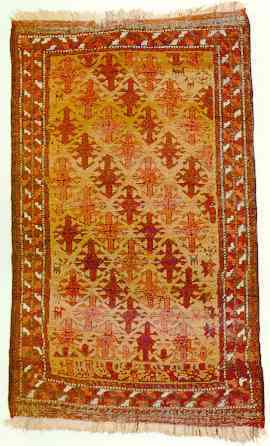 This is a handmade Taimani Baluch Rug. The dyes are good. It dates to the late 20th century. 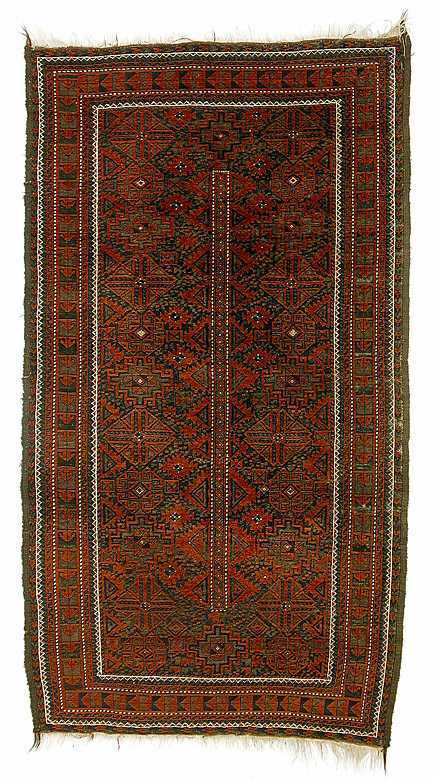 Baluch Rug, North East Persia, late 19th C.
Size: ca. 206/ 201 x 138 cm. Size: ca. 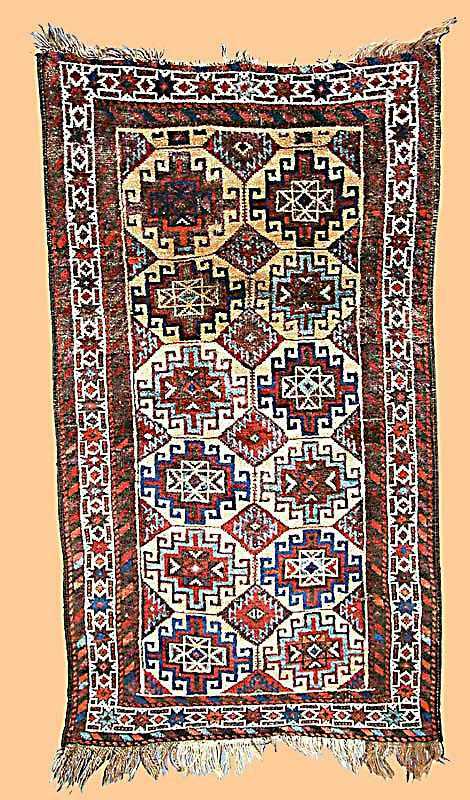 200 x 121 cm. 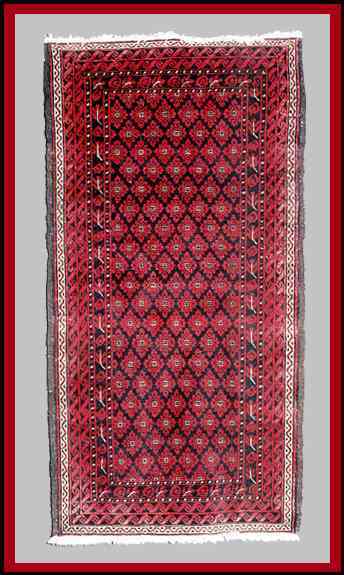 Baluch Rug, Persia, second half 19th C.
Size: 4ft. 7in. x 2ft. 9in. Condition: Crease repair, some wear to one end, some selvage damage. Size: 2ft. 11in. x 5ft. Size: ca. 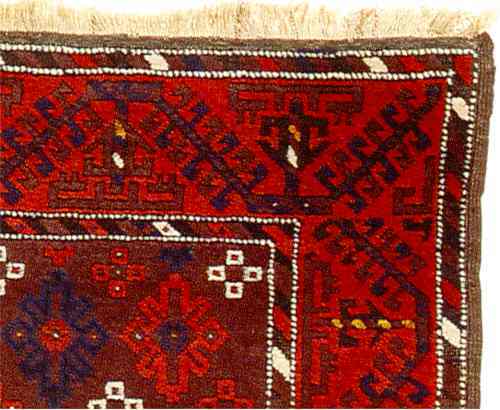 134 x 76 cm. Size: ca. 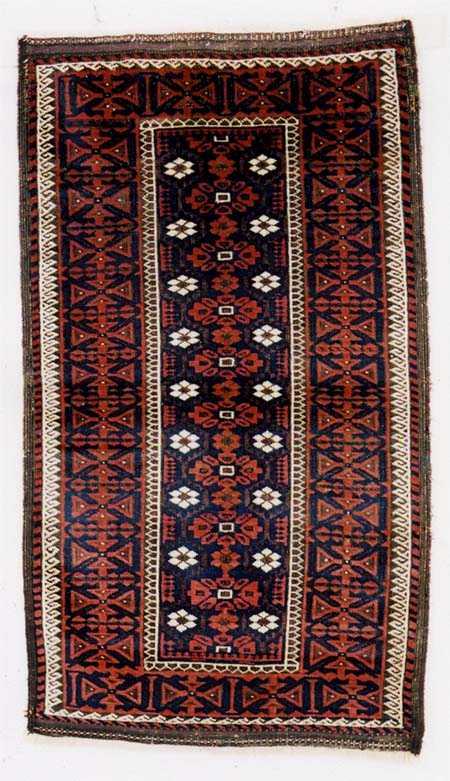 184 x 100 cm. 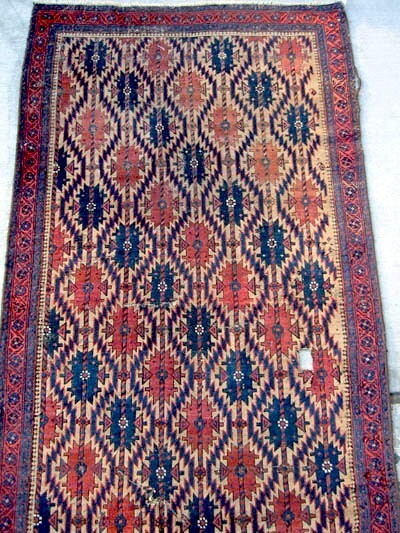 Condition Note: Original polychrome banded kilim end finishes. 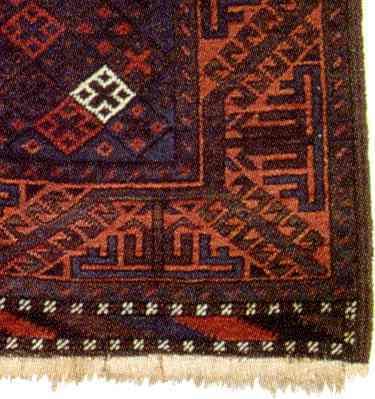 Origin: Northwest Afghanistan. 4th quarter 20th century. 3 feet 8 inches by 6 feet 8 inches (not including fringe). Weft: Gray Cotton, 2 shots. Ends: 1/2 inch plain weave. Selvages: two 2 part cord double looped with black goat. Further Notes: Excellent condition, in "As New Condition". Slight dye transference in the fringe. 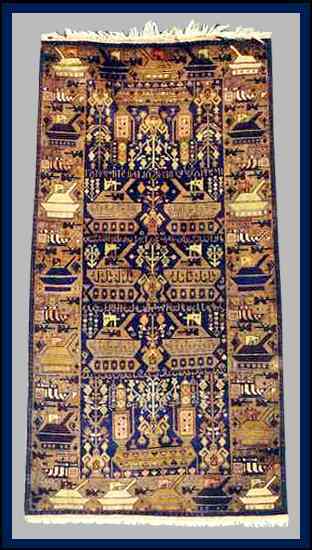 Intact, full pile rug. 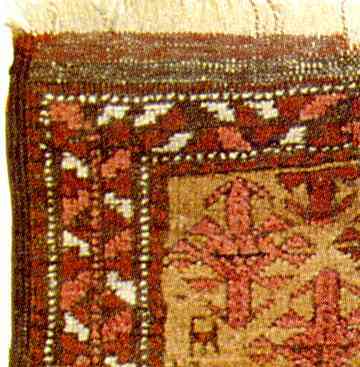 Excellent Afghan war rug from the Chahar Aymaq people of the Herat area in what is now called Afghanistan. Very vivid war imagery, tanks, machine guns, assault rifles, and a surprising number of landmines. Afghanistan is strewn with landmines and many are quick to condemn the use of landmines. Landmines are used because they are a rebel's weapon or one that can be used by an under funded army. Here we have a wide variety of weaponry. A tank flanked by two had grenades with a grenade launching machine gun on top. Under that a helicopter surrounded by assault rifles. The assault riffles are in the style only seen in the Herat area.